Halloween night is often one of the deadliest nights of the year due to the number of impaired drivers on the streets. According to the National Highway Traffic Safety Administration (NHTSA), in 2009, 48 percent of all traffic fatalities on Halloween night involved a driver or a motorcycle rider with a BAC of .08 or higher. Halloween means dark streets full of little kids distracted by candy and costumes. That makes it especially important to start planning a safe and sober ride home from whatever fun you’ll be having that night — so your evening doesn’t take a truly scary turn. Whether at a Halloween party, a costume contest at a bar or trick-or-treating through the neighborhood, many of us will be on the road this weekend. NHTSA and the Ad Council are reminding everyone that the best way to stay safe is to plan ahead and designate a sober driver before you head out for your Halloween festivities. • Designated Driver Drink List — One of the most important things you can do before going out is designate a sober driver. 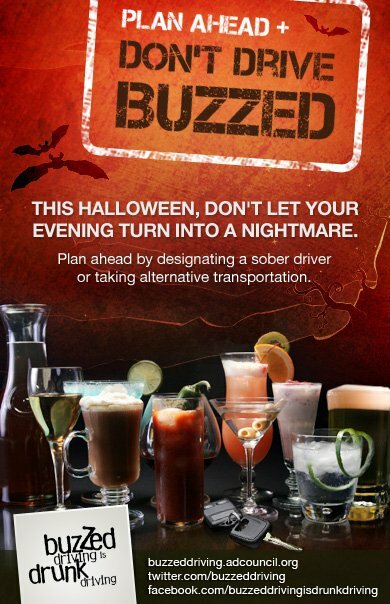 If you’re throwing a Halloween party, make sure to offer non-alcoholic drinks for the sober drivers. We’ve compiled a Facebook tab with 50 non-alcoholic party drink recipes. • Alternative Ride Locator — There's a Facebook tab with a list of nationwide alternative ride programs that can help keep you safe. • Buzzed Driving is Drunk Driving website — You can sign a pledge not to drink and drive; play “Spot the Difference,” an interactive game that simulates the effects of buzzed driving; and watch a real-life video about how buzzed driving changed one woman’s life. Remember: Buzzed Driving is Drunk Driving. Disclaimer: I am participating in a Public Service Campaign through Global Influence and have not received anything for my participation. I do this because I truly care about this issue. I've been away from my blog for so long, but I'm ready to get into the holiday spirit and get some reviews and prizes for my online friends! A Simple Kinda Life is currently seeking sponsors for a Holiday 2011 blog party! A Coming-Back-To-Blogging party, if you will! If you're interested in being a part of this party, please email me! I'm also looking forward to partying with my readers... hey... I'm honest! It's been so long since I've updated any of my online friends of anything! But I wanted to share some wonderful news with you!